Our Father in Heaven commands us to be thankful in all things (see 1 Thessalonians 5:18), and He requires that we give thanks for the blessings we receive (see D&C 46:32). We know that all of His commandments are intended to make us happy, and we also know that to break commandments leads to misery. We all can make the choice to give thanks in prayer and to ask God for direction to serve others for Him﻿—especially during this time of year when we celebrate the Savior’s birth. God the Father gave His Son, and Jesus Christ gave us the Atonement, the greatest of all gifts and all giving (see D&C 14:7). Writing down our experiences and blessings can help us remember them and give us something to refer back to. Consider asking those you teach to write down what they are grateful for﻿—to help them remember the blessings they have received, recognize the blessings of the present, and look forward to the blessings of the future. 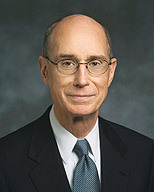 You could also encourage those you teach to follow President Eyring’s example in asking Heavenly Father to direct them to someone they can help or serve. God the Father gave His Son, and Jesus Christ gave us the Atonement, the greatest of all gifts and all giving.